ELORA - The Elora Mohawks came on strong when it counted at the Founders Cup tournament last week, winning the national championship for Junior B lacrosse in convincing style. Players and team staff received their gold medals at a ceremony Saturday night, after defeating the Seneca WarChiefs 9-5 in a hard-fought game at the Turtle Dome in Akwesasne near Cornwall. They were cheered on by a large contingent of supporters who travelled to the tournament, along with a crowd that gathered for a viewing party at the Elora Arena, organized as a food bank fundraiser by Centre Wellington Minor Lacrosse. It was the first national title for the team since 2005. They had captured the Ontario Junior B Lacrosse League Championship on Aug. 9, defeating the Clarington Green Gaels in a best-of-five series. Erin’s drinking water systems are under new management. The town signed an interim agreement on June 11 with the Ontario Clean Water Agency, a crown corporation that will now deal with all aspects of local drinking water quality, delivery and infrastructure maintenance. “As we transition with OCWA, we would like to express to residents that there will be no delay or interruptions in regular water services,” said Communications Officer Jessica Spina. The systems in Hillsburgh and Erin village will continue to be owned by the municipality, with town council responsible for oversight. Members of the water department staff who expressed an interest in continuing to work on the local systems as employees of OCWA have been offered positions, while others chose not to join the Ontario Public Service. “We would like to thank the Water Department for the work and commitment to service they provided to the town and wish the individuals the best in their future endeavours,” said Spina. On April 24, council voted to enter negotiations with OCWA, based on a bid that promised savings of more than $200,000 in a five-year deal. This will allow more money to be saved for water infrastructure improvements and offset the need for water rate increases. Sections of the local systems are antiquated, prone to freeze-ups and leakage, and have been in need of replacement for some time. The town is searching for new well sites to meet provincial requirements for redundancy, and to support new residential and business growth. OCWA operates water and wastewater systems for more than 180 clients. They will now share liability with the town for any problems with the water systems. The agreement was signed by the CAO and mayor. The final contract had not been signed last week, presented to council or made available to the public. Alls expects that to happen soon. Customers can continue to call 519-830-8600 for any after-hours drinking water emergencies. For water billing and water meter support during regular hours of operation, call Town Hall at 519-855-4407 ext. 221. Assessment growth in other parts of Wellington County is lightening the tax burden on Erin residents, who will see an overall reduction of 1.8 per cent on their tax bills. The total tax on a house assessed at $500,000 would decline about $100. Council passed the tax rate bylaw on June 5, after a report by Director of Finance Ursula D’Angelo said the estimated savings (not including the impact of property value changes) would total $19.99 for each $100,000 of residential assessment. In December, council had considered enacting a .5 per cent decline in town taxes (which are 25.94 per cent of the total) using new assessment revenue of $282,665. Instead they put some of that money into the infrastructure reserve fund and settled on a .5 per cent increase. That means for local purposes, the town will collect $6.6 million, with residents paying $1.42 more for each $100,000 of assessment value. That increase is more than offset by decreases in county and education taxes. In January, the county passed their 2018 budget with an average tax increase of 2.5 per cent, but the percentage varies in each local municipality. In Erin it is a decrease of 1.94 per cent, or $12.41 for each $100,000 of assessment. The town will collect $14.2 million on behalf of Wellington County, which is 55.73 per cent of local taxes. Erin has had assessment value growth on existing properties and new construction. Other Wellington municipalities, however, have had even more assessment growth, so they are paying a slightly higher share of county taxes than they used to. The Erin education tax totals $4.7 million, which is 18.33 per cent of the total. It is declining 5 per cent, or $9.00 for each $100,000 of assessment. The proportion of property taxes paid by residential owners remains high, but it has declined from 87.7 per cent in 2017 to 87.5 in 2018. The commercial share is down slightly, but the industrial and farmland shares are up slightly. The 2017 assessment roll shows the total value of all Town of Erin properties at $2,464,384,051. Final tax bills go out in mid-July, with final installments due on August 31 and October 31. An overflow crowd and a petition with 772 names have forced Erin councillors to delay a controversial gravel pit vote, with the town now seeking a better deal with the pit operator. Council decided on Tuesday to defer a decision on whether to recommend that the county allow Halton Crushed Stone (HCS) to expand its existing gravel pit north to County Road 52. 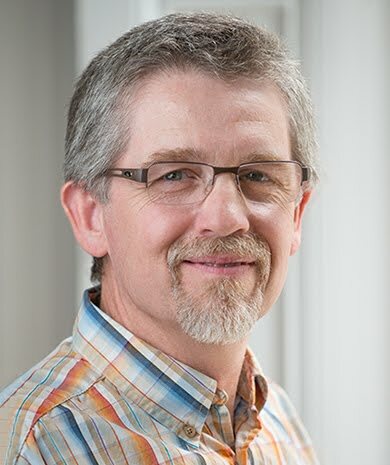 Mayor Allan Alls said CAO Nathan Hyde will meet with the company to explore ways to reduce the impact of the expansion, across the road from the BelErin subdivision. He said the process could take until this fall. Residents are concerned about noise, dust, traffic and visual appearance, and want a 300-metre setback. Various studies and concessions by HCS have not been sufficient to move the project forward, and the company says it is open to further discussions. Resident Robyn Johnstone presented a petition urging a No vote, saying the expansion “threatens our families, Erin’s natural appeal and future prosperity.” It says property values would decrease by up to 30 per cent, and that recycling asphalt would release toxic dust. “We are not willing to roll the dice when it comes to the health of our children,” said Johnstone. The expansion would allow gravel extraction above the water table on 150 acres of agricultural land, and storage of up to 60,000 tonnes of recycled asphalt. County Planning Director Aldo Salis recommended approval, saying the proposal is “in the public interest” and that concerns have been adequately addressed. The approval process requires an Official Plan change by the county and a further zoning decision by the town. The outcome could be appealed by either side. Coun. Matt Sammut declared a conflict of interest since his home is near the pit, and he could not vote or participate in the debate. Erin town councillors could have shown some courtesy by at least pretending to have a public discussion about getting rid of the water department. Instead, after a lengthy closed session on April 24 and a brief public slide show by a consultant, they voted 3-2 to negotiate a contract with the Ontario Clean Water Agency (OCWA) to take over water operations. One of the most important decisions in the town’s history was taken without public notice, and without a public discussion of the strategy by councillors or staff. With OCWA promising to save urban ratepayers $200,000 a year, it could be an excellent decision. It comes with risks, however, and with many ancient water pipes to replace and more wells needed, the savings could be a drop in the bucket. Normally, councillors and the public get a chance to consider major proposals well in advance. In this case, the matter was a single line on the agenda. The town had commissioned an independent cost-benefit analysis, comparing the existing operations to two outside bids. Normally a consultant’s presentation is printed in the agenda, so people have at least two days to think and react. In this case there was nothing. Normally there is a staff report analyzing the pros and cons – something that had been promised on this issue – but again there was nothing. The explanation from communications officer Jessica Spina is that a recommendation from CAO Nathan Hyde would “eliminate the objectivity” of the consultant’s report. Water superintendent Joe Babin was not allowed to speak during or after the meeting. Maybe he has some advice for council that the public should hear. A complex matter like outsourcing water requires discussion. When did that discussion take place? Council never saw the request for proposals that went out in February. A section of the April 24 meeting was legitimately closed to the public for matters of labour relations, employee negotiations or litigation. Other possible exemptions for confidential information and outside negotiations were not claimed. The Municipal Act limits discussion to specified topics. Spina said that in closed session, the consultant “provided an objective view regarding the water department’s operation”, with an “overview of the department’s financial records which included proprietary information”, and that questions were asked about the analysis “as it pertains to staffing and department finances”. Any new strategy might be construed as impacting labour relations. There will be grey areas, but it would be advisable (though perhaps not convenient) to deal with sensitive personnel and negotiation issues in closed session, while discussing others in public. These would include the concept of outsourcing, water quality monitoring, response to emergencies, criteria for extra costs, dispute resolution, performance in other municipalities and the option to have OCWA manage future wastewater. In 2016, closed meeting investigator John Maddox urged Erin to keep meetings open to the public whenever possible. “If in doubt, you should probably err on the side of caution and stay open,” he said. Councillors must limit discussion to the announced reason for the closed session, and not “wander off-topic”. Some councillors were clearly uncomfortable when they returned from the recent closed session, having been warned not to reveal details. Councillors Jeff Duncan and John Brennan voted against starting OCWA negotiations, with concern that the mayor and CAO would be authorized to sign the contract without council seeing it. Coun. Matt Sammut, a vocal critic of water costs, voted Yes, but had concerns about “impacting a number of lives”. He had second thoughts about his vote, but could not change it. He said if negotiators see “holes” in the deal, it should still come back to council. Mayor Al Alls told councillors to forward concerns privately to the negotiating team. The mayor and CAO may have got their way, but at what cost? Considering that they recently promised to improve communications with the public, the meeting was still a disaster. New efforts are being made to reduce the impact of Halton Crushed Stone’s proposed gravel pit expansion south of Erin village. At an April 17 meeting, County Planner Aldo Salis supported the expansion, and HCS offered changes to appease opponents, but council’s debate was cut short when the vote was delayed until May 15. Councillor Jeff Duncan, who is opposed to the proposal as it now stands, did not get to speak. He says a gravel trade could move the pit farther from nearby homes. “I propose a significant amount of the gravel deposit that the Town of Erin has under the TenthLine that is part of the application be assigned/traded to HCS as a concession for a significant setback,” he said. He wants no extraction in a triangle measured 300 metres along the roadways. Possible closure of the Tenth Line in about 20 years to extract town-owned gravel has been discussed, but it would require an additional agreement between the town and the pit operator. Roy Val, who received a Town of Erin Volunteer Award recently for his research into this and other local growth issues, said he was pleased that HCS had recognized the environmental concerns related to asphalt recycling on the site by agreeing to groundwater monitoring. HCS has doubled the minimum 30-metre setback, promising not to mine the first 60 metres from the northwest corner of their lands. They also committed to mine the next 95 metres in a two-year period, starting whenever they decide to strip the topsoil. Duncan’s proposal suggests a two-year limit on a larger area, comprising 50 per cent of the land parcel closest to the subdivision. He also wants the operator to set up a Community Liaison Committee. The proposal is for mining above the water table, but Duncan wants tighter restrictions, saying HCS could too easily get approval for mining below the water table. He would also like to see asphalt recycling removed from the land use, or at least temporarily restricted while the Ontario government is developing new policies on this land use. “Placing 60,000 tonnes of a hazardous material on the floor of a gravel pit could be one of the worst places to put it,” he said. HCS and Salis say the asphalt poses no risk to human health. After years of concern about the cost of running the Erin water department, town council has finally pulled the plug – deciding to contract the job to an outside agency. The town expects to save over $200,000 per year in a five-year deal with the Ontario Clean Water Agency (OCWA), a crown corporation that operates water and wastewater systems for more than 180 clients. Council voted 3-2 at a special meeting April 24 to begin negotiations with OCWA. They delegated full authority to Mayor Allan Alls and CAO Nathan Hyde to sign a contract without bringing it back to council. Councillors John Brennan and Jeff Duncan voted against the motion. They both support contracting out, but said they wanted more information. The town will retain ownership of the system, and hopes to use the savings to reduce future water rate increases. More money will go into reserves needed for replacing antiquated parts of the system. In February, CAO Nathan Hyde issued a Request for Proposal, and received two bids. Town council was not involved in the process, which included hiring an independent consultant, Public Sector Digest (PSD), to compare the bids to the existing costs of running the water department (about $1 million annually). In closed session, PSD provided council with analysis, and then gave the public an abridged version. Measured in 2018 dollars with inflation at 2 per cent, a bid from H2O Systems would save the town $347,723 over 5.5 years. The OCWA bid would save $1,112,839. Coun. Matt Sammut asked, “Do you feel a good analysis has been done from a qualitative perspective.” Tyler Sutton and Saramad Mahbouba of PSD said their only reference was the executive summaries of the bidders themselves, who each claimed to have an excellent record of service delivery. The bids were not made public. “The Town of Erin can expect to benefit from economies of scale and accumulated experience,” the PSD report said. The town is expecting strong technical support, reducing the need for other consultants. The mayor said OCWA can do the job with fewer hours and less overtime, since staff service more than one client, and that OCWA will share liability for the system. OCWA manages 75 per cent of Ontario’s outsourced water treatment facilities, serving 4.5 million people. The agency has already made a pitch to manage Erin’s future sewer system. Guelph-Eramosa Township used to have OCWA managing Rockwood’s water and wastewater systems, but cancelled the contract 10 years ago, citing unpredictable extra costs. Alls said he has heard positive feedback from other municipalities. Councillors were warned not to discuss the water service bids in public, because of staff privacy and to avoid harming the town’s negotiating position. Water Superintendent Joe Babin was also barred from speaking. Mayor Al Alls said councillors should forward any concerns privately to the negotiating team. Duncan said the decision was “hasty”. He said bringing a tentative deal back to council in closed session would be a normal negotiation process, but the CAO said it would be unfair to OCWA and the negotiating team to have to start the process over again. The Ministry of the Environment and Climate Change will mediate between the Town of Erin and any residents who appeal the results of the Wastewater Environmental Assessment (EA). The culmination of the Master Plan and Municipal Class EA process, which was mandated in 2004 and started in 2009, is publication of an Environmental Study Report (ESR), which is subject to a formal 30-day review period. The completed report is almost 2,000 pages, and will be available at erin.ca, in libraries and at Town Hall. On April 24 town council got a report from Joe Mullan, President of Ainley Group that has conducted Phases 3 and 4 of the EA. They agreed that the review period would be May 14 to June 14. People can make comments to the town, or make a more formal appeal, known as a request for a Part II Order or a “bump-up”. This must be submitted to the Ministry of the Environment and Climate Change by June 14. Eventually, Minister Chris Ballard would issue an order binding on all parties. He could require additional investigation or approve the plan, allowing the town to proceed with funding requests, design and construction. A similar Part II Order process for the Station Street bridge, dam and pond lasted more than a year. Mullan said his team would hold another meeting of the Public Liaison Committee and meet with others to resolve concerns. He said Part II Order requests should be as specific as possible, so the ministry can ask questions of the town and consultant. “The ministry becomes a mediator, and then ultimately a decision maker,” said Mullan. Ainley has already responded individually to 26 letters from residents. Concerns include costs for urban residents, growth of the urban population to 14,559 in the coming decades, possible costs for rural residents and risks to the natural environment. Mullan says public concerns have been addressed through technical studies and public meetings over the last two years, but some residents say that the answers to their questions have been inadequate. The preferred alternative includes a gravity collection system with low-pressure pumping in some areas, a forcemain connecting Hillsburgh to Erin village along the Elora-Cataract Trailway, a plant at County Road 52 and Tenth Line using membrane technology and UV treatment, and an outlet to the West Credit River at Winston Churchill Blvd. After major contributions from developers and funding from senior governments, the local share of the eventual $118 million project could be $20 million. If so, each serviced property would pay an average of $7,500 for construction – though the actual amount could vary per property once the allocation formula is decided. It could be financed for up to 15 years. In addition, individual connection charges paid to a private contractor are expected to be in the range of $4,000 to $8,000, depending on the property. Once the system is running, yearly wastewater usage fees are estimated at $500 to $600 (based on rates in nearby municipalities). Available in the wastewater section of the town website is a Frequently Asked Questions document with information on the project. The Town of Erin Facebook page has an animated video about the costs to property owners. Also on the site is Mullan’s 38-page presentation to council with the April 24 agenda. It includes a capital cost summary for all elements of the wastewater system and outlines financing options. Halton Crushed Stone (HCS) is offering new concessions in its bid to get town council approval for a gravel pit expansion just south of Erin village. Councillors deferred their vote on the issue until May 15, after hearing a presentation on April 17 from HCS representative James Parkin. His offer first came in a letter to council last Friday, just after a report from Wellington County Planning Director Aldo Salis was released, recommending approval of the expansion. The concessions are intended to reduce the impact of the pit on the community, especially nearby residents on McCullogh Dr. and Aspen Court. Parkin said HCS would complete gravel extraction within two years of topsoil removal in the corner of its property closest to the homes – a pie-shaped zone with a radius of 185 metres from the corner of the urban boundary. It’s not clear exactly when the two years would start, but HSC has planned to mine that area first. HCS has also agreed to a monitoring program for ground water quality near its asphalt recycling stockpiles, to plant trees immediately on the northern border instead of within one year, to apply calcium chloride annually to suppress dust on the Tenth Line and to clean up any gravel spillage on Road 52. Coun. Rob Smith said the deferral will be “an opportunity for citizens to chime in” on whether the changes are acceptable. Salis told council the proposed land use is “appropriate and in the public interest” and conforms to provincial and county policies. The plan to expand the pit north towards County Road 52 has been the subject of technical studies and public meetings over the last two years. “The applicant has demonstrated that the proposed use can be carried out in a manner that will reduce potential social, economic and environmental impacts,” Salis said. The expansion would be on 50 acres west of Tenth Line and 100 acres to the east. It includes a 60-metre setback in the northwest corner, one of several changes already made by HCS. Many residents want a 300-metre setback, even though the land is already zoned for gravel mining. Resident Roy Val said it appears the previous owners of the pit had no intention of mining the northwest corner, and although there is no documentation, that the subdivision may have been approved with that understanding. Salis said any contaminants from asphalt recycling would be at concentrations well below those of concern to human health. A study found there would be no impact on groundwater or the nearby West Credit River. The expansion would be on prime agricultural land, but Salis said aggregate extraction is acceptable since the land will eventually be restored to agricultural use – similar to rehabilitated land on the HCS property. The Town hired WND Associates to review a visual impact study. They said proposed improvements to berm heights plus tree plantings are “adequate” for visual appearance, for screening the pit from second-storey views and for screening views further north on high points of the Tenth Line. The public school board has put the brakes on a process that could have studied the possibility of closing Ross R. MacKay School in Hillsburgh. A draft of the Upper Grand District School Board’s Long Term Accommodation Plan (LTAP) released this week has no new priorities or actions proposed for this area. “There is uncertainty around the timing and scope of wastewater servicing, and as such, it is not appropriate to identify elementary accommodation priorities for the Erin Elementary Review Area at this time,” the draft report says. At a Feb. 28 meeting to prepare for this report, many local residents expressed support for keeping the school open. They also suggested a boundary review to increase MacKay’s catchment area, the transfer of some special education classes to the school, and the possibility of making Brisbane Public School entirely French Immersion, which could bring more English-only students to MacKay. There will be more public consultation before the final plan goes to trustees in June, including a meeting on May 2 in the Erin Public School gym with a question and answer session. With the Town of Erin undertaking a Municipal Class Environmental Assessment to determine a preferred alternative for wastewater servicing in Erin village and Hillsburgh, the board has published two scenarios, one with minimal growth and the other with moderate growth. If the town gets adequate funding and decides to proceed with a wastewater system, construction could start within five years. Without wastewater, more than 400 student spaces are expected to be empty in Erin public elementary schools by 2022. Ross R. Mackay’s population of 90 students would drop to 64, using only 32 per cent of the school’s capacity. That rate would stay low without housing growth, but enrolment could rebound to 165 (83 per cent usage) in ten years if new subdivisions are built. Residents who will not get wastewater service for their homes continue to get conflicting messages about whether they will have to help pay for the system. A document from consultant Ainley Group, posted in the wastewater section of the town website, erin.ca, attempts to summarize questions from the Feb. 2 public meeting. Town council has not taken a position on this, but Mayor Allan Alls has promoted the idea that all property owners should pay for construction. The eventual local share of construction costs (after grants are received) could be $20 million. In an earlier interview, Alls emphasized that wastewater would bring economic benefits to the entire town. He suggested the issue could “bring some people out of the woodwork to run for council”. The Ainley document says dividing $20 million equally among the 2,672 urban lots (residential, commercial, industrial and institutional) would mean an expense per property of $7,500. The exact formula has not been decided, since costs could be allocated by various factors such as property frontage. But it is clear that sharing the construction cost with rural residents (who are the majority), plus those in unserviced urban areas, would drastically lower the cost per household. Ainley says the construction cost could be paid as a lump sum by homeowners, or through a loan from the town, as part of the municipal tax bill. Hook-up will be mandatory in serviced areas. The construction cost does not include the cost of individual hook-ups, which could range from $4,000 to $8,000. This would have to be paid privately by the homeowner, to a contractor that they would have to hire themselves. Ainley has sent individual responses to residents who submitted questions following the Feb. 2 meeting. The firm is completing an Environmental Study Report, as the Environmental Assessment (EA) wraps up. It will be open to public comment from May 14 to June 14, and the EA results can be appealed to the Minister of the Environment, as a request for a Part II Order. The town will be reviewing its Official Plan to identify specific areas for new housing – a step that has been delayed for several years. The phasing of wastewater construction could follow many different scenarios, depending on planning decisions and financing. In one scenario created by Ainley, if adequate funding is received, construction of Phase One could begin in the second half of the next council term (2020-2022). About 60 per cent of the Phase One capacity could service existing residents, while 40 per cent could be allocated to new development, allowing the serviced urban population to grow from about 4,500 to 8,864. Phase Two would be entirely for new growth, and could happen about 2028-2030, eventually boosting the urban population to 14,559. In the railroad boom of the late 1800s, four companies built an ambitious web of steel among villages between Georgetown and Orangeville. 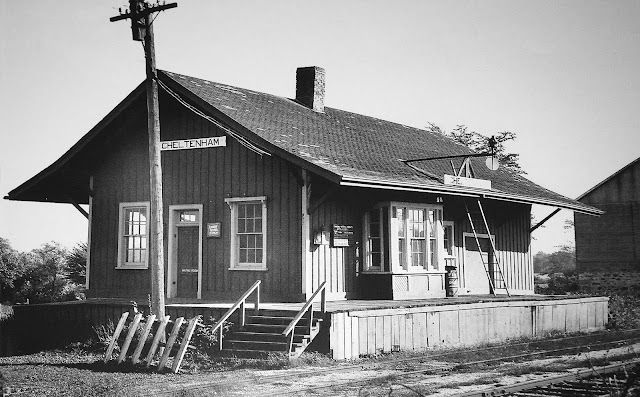 The local train station became the new community hub – a meeting place where farmers and millers would ship products, visitors could arrive without a grueling stagecoach ride, shops would receive efficient deliveries and residents might gather to get election results by telegraph. As rails emanated from the economic powerhouse of Toronto, the first train station in Peel County was in Bolton. It was on the Toronto Grey and Bruce (TG&B) line that headed west starting in 1869. In 1908, Bolton became a major junction point for a new line running north through Palgrave and up to Sudbury – an all-rail route to the western provinces. In order to reach Caledon Village, TG&B builders had to climb Caledon Mountain. They designed the Horseshoe Curve, where the rail line doubled back on itself to gradually gain altitude. Trains could only climb with five rail cars per engine. The Great Horseshoe Wreck killed seven people in 1907 when a Canadian National Exhibition excursion special came down the Curve too fast and derailed. 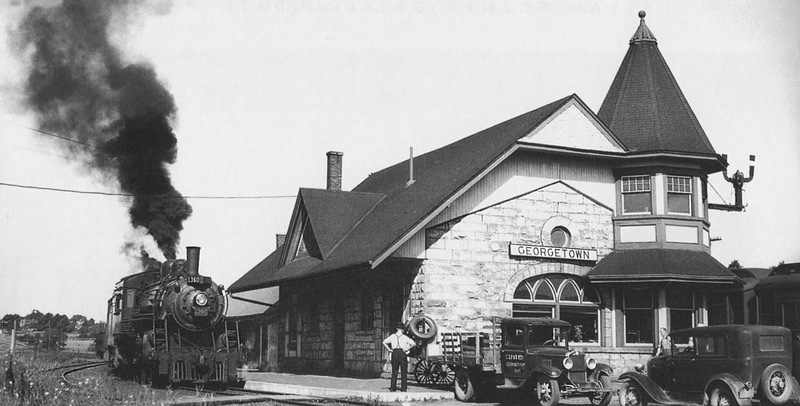 The TG&B brought passenger rail service to Orangeville in 1871 and it was to last 100 years. Within six months, Orangeville was shipping up to 16 loads of grain a day as well as timber, lumber, and fence rails. In the 1880s a stagecoach ferried visitors to and from the railway station on Mill Street and the hotels and businesses along Broadway. and is now home to the Barley Vine Rail Co. restaurant and bar. The TG&B was taken over by Canadian Pacific (CP) in 1884. In 1907, they built a new Orangeville station on the east side of the rail yard on Townline. The distinctive conical roof resembling a witch’s hat covered a waiting room that once had separate sections for men and women. 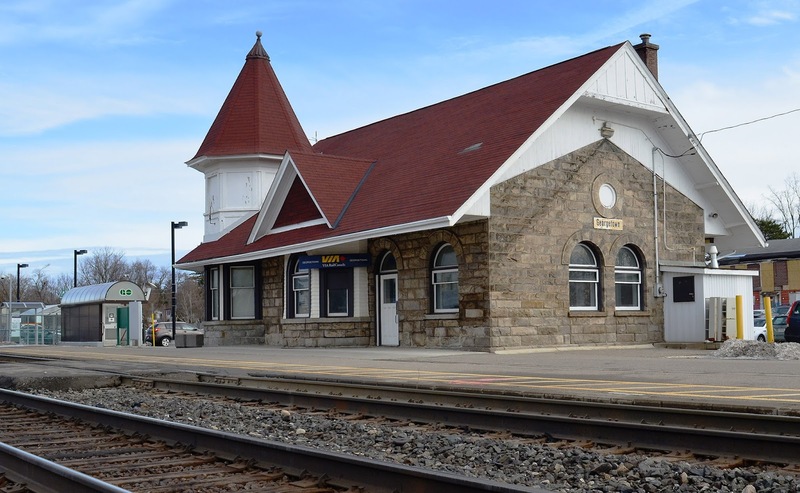 It is one of only three stations in Canada constructed in this exact style. In 1989, to avoid demolition, it was moved to Armstrong Street and converted to commercial use. The nearby rail yard bunkhouse and lunch bar, built in 1943, burned down in 2006. 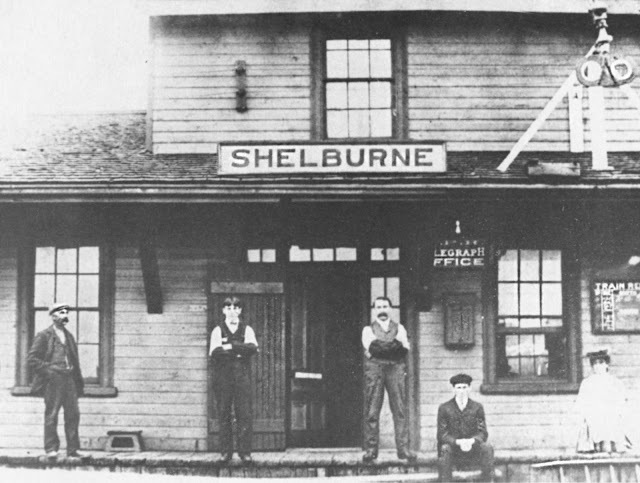 Just past Orangeville was Fraxa Junction, where a northern branch of the TG&B carried on through Shelburne, reaching Owen Sound in 1873.
just west of Orangeville, created by Steve Revell. Elizabeth Willmot, in her book Meet Me at the Station, says people would gather along that line to see the Steamship Express headed north. This train was considered glamorous because passengers would later sail out of Owen Sound harbor, headed for Sault Ste. Marie. Pacific’s modernization and upgrading program, carried out in the 1910s. About 10 miles north of Orangeville was Crombies station, a tiny board and batten building where travellers would wave a green and white flag to get trains to stop. It is preserved at the Dufferin County Museum. 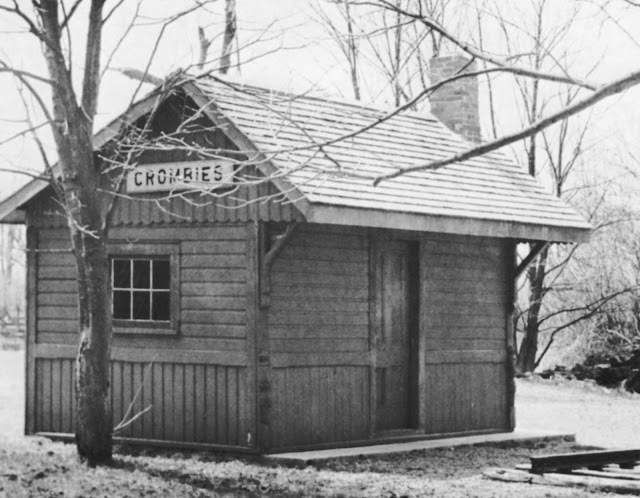 The Crombies flag stop station north of Orangeville. The Credit Valley Railway (CVR) served an area west of the TG&B. It had a route from Streetsville through Cheltenham, Inglewood and Alton, ending at Orangeville. 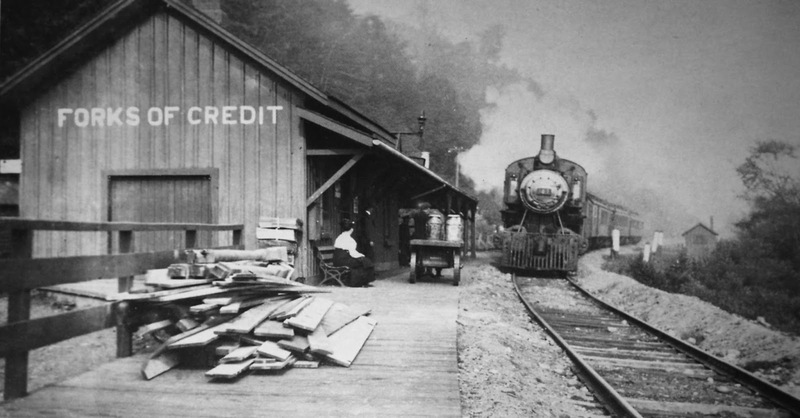 Alton had a CVR station in the village, plus a TG&B station a mile’s walk away. CPR steam engine 183 rolls into Forks of Credit station in 1905.
the trestle bridge over the Credit River. the CNR Milton and the CPR Streetsville subdivisions. Published in Steam at Allandale by Ian Wilson, 1998. Press in Running Late on the Bruce, by Ralph Beaumont and James Filby. Hillsburgh, Orton and Fergus. It is now the Elora Cataract Trailway. At Cataract, the 47-km Elora Branch of the CVR split off towards Erin and Hillsburgh. The CVR was never financially secure, and like the TG&B, it was taken over and revitalized by CP in 1884. 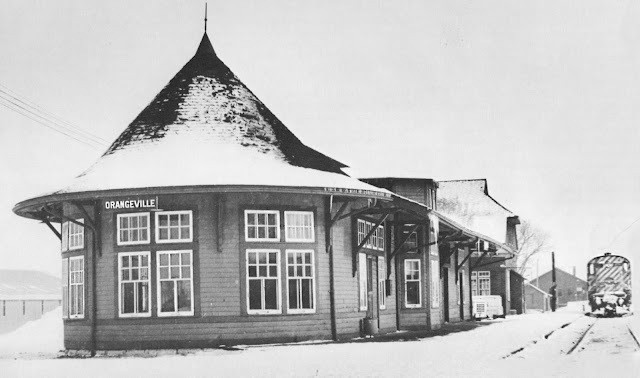 In Orangeville, the CVR station on East Broadway in the Credit flats was abandoned in favour of the TG&B station. For the past 18 years, Cando Rail Services has used the old CVR route to run scenic Credit Valley Explorer excursions and freight deliveries between Orangeville and Mississauga. The firm recently announced it is ending these services, and a new operator is being sought. 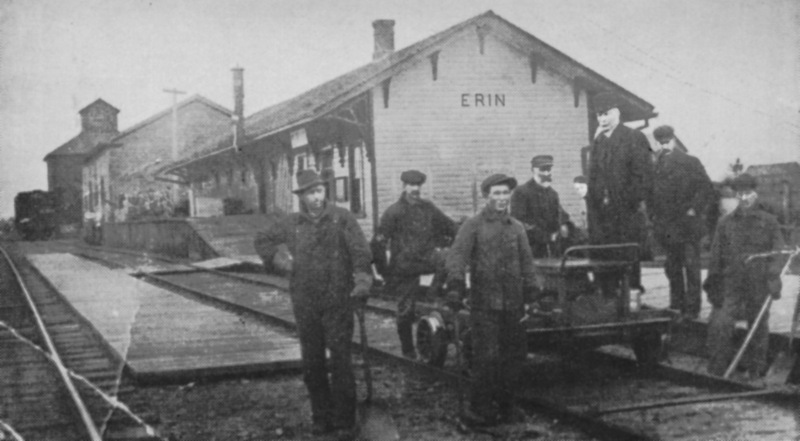 The arrival of the railroad prompted incorporation of the Village of Erin in 1879. 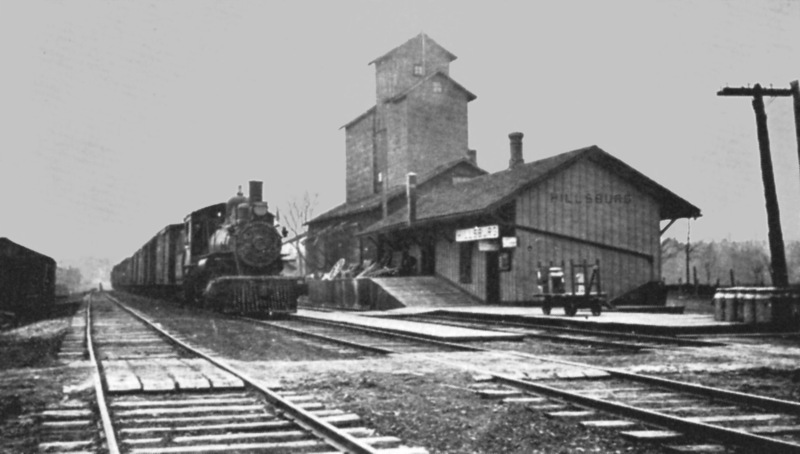 The simple wood frame train station was a combination passenger and freight depot, with a grain elevator and coal dealership nearby. In the early 1900s it was often busy with train excursions for sporting events, dances, boating and cottaging at Stanley Park, a major tourist attraction. by The Boston Mills Press. 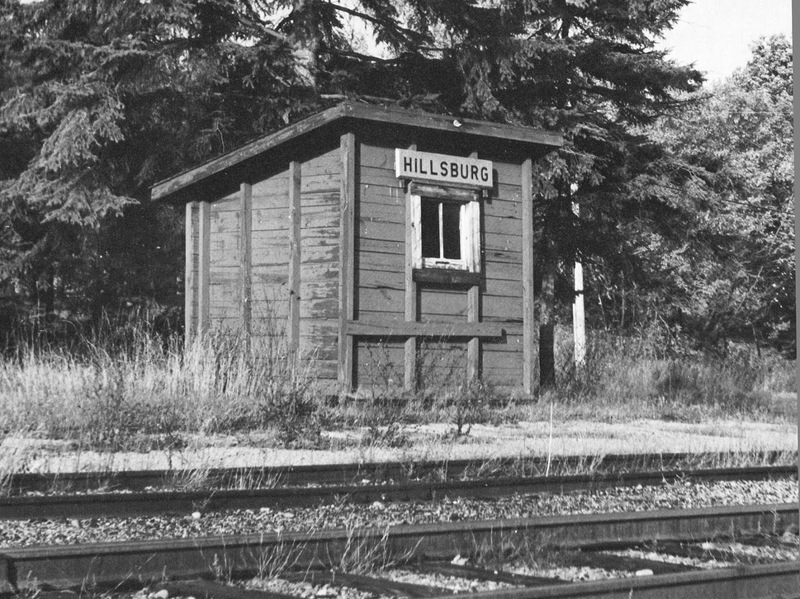 The Hillsburgh station was built on the west side of the millpond created by the Gooderham and Worts dam. A station road and bridge had to be built over the dam to connect with the village. The Hillsburgh station and grain elevator in 1884. The station burned down in 1932, and a new small building was erected in 1933. 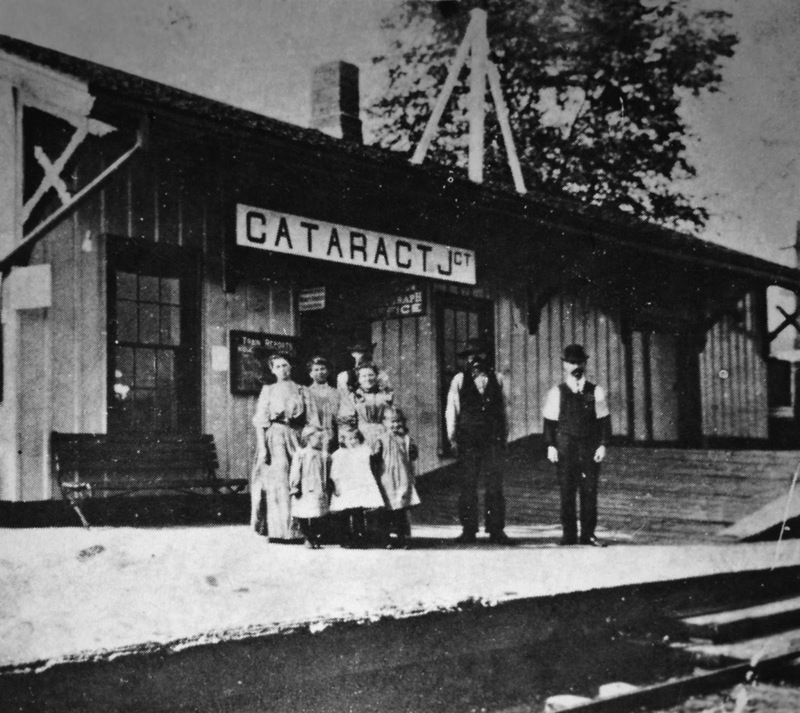 In that year, service on the branch was cut from four daily trains to two, one going from Orangeville to Elora at 11:30 a.m. and one returning about 5:00 p.m.
line from Cataract to Elora, which opened in 1879. The rails were lifted in 1988. The Caledon area was also served by the Hamilton and North-Western Railway line running through Georgetown to Barrie (later owned by Grand Trunk and CN) starting in 1877. Along what is now the Caledon Trailway, there were stations at Terra Cotta, Cheltenham, Caledon East, Centreville and Palgrave. There was a “union station” at Inglewood (Sligo Junction) where it intersected the Credit Valley line. The Caledon East Grand Trunk station in the mid-1950s. Published in Steam Scenes of Allandale by Ian Wilson, 2007. 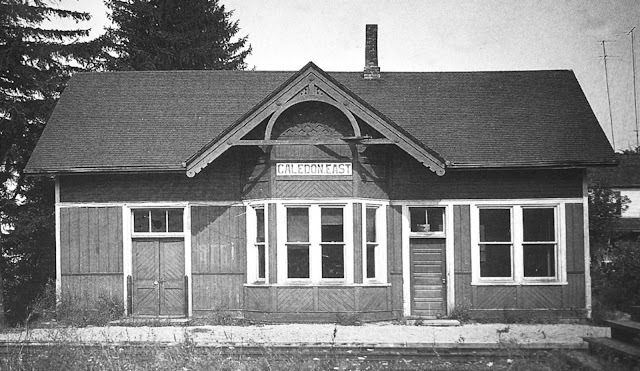 The Grand Trunk Railway built a Georgetown station on its Toronto to Guelph Line in 1858 with attractive stone construction and unique woodwork. It was taken over by CN in 1923. 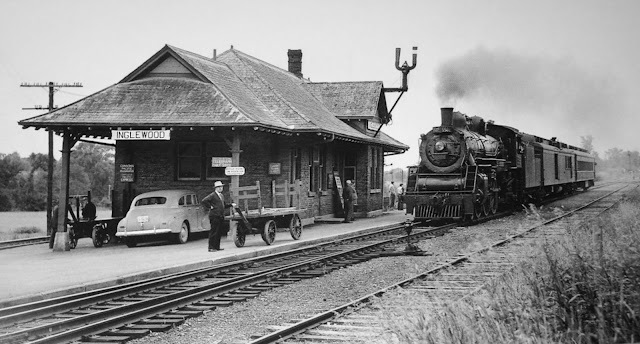 Steam engine at Georgetown CN station in the 1950s. In his book Steam Scenes of Allandale, Ian Wilson reports that Georgetown remained busy through the 1950s with 14 passenger train arrivals and departures on most days. It became a VIA Rail station in 1977 when CN and CP merged passenger service, and GO train commuter service started the following year. The Georgetown train station remains well used today. The role of train stations has certainly changed, but they are key to understanding how small rural communities once flourished as industrial centres in a bold new country. The Soil Health Coalition chapter in Erin is recruiting citizen scientists and local farmers to help measure key attributes of local soil, as part of a campaign to promote regenerative agriculture and reverse climate change. After two years of work, including Our Common Ground events last spring and $2,500 from the town for a feasibility study, the coalition has received a $70,000 grant from the Friends of the Greenbelt Foundation for a soil health project. The funding was announced at a March 28 film night at the Erin Legion. Mayor Allan Alls was on hand, congratulating the group and offering to promote the project on the town website. On March 29 the coalition hosted a farmer-to-farmer networking day at Hillsburgh Baptist Church. Members include representatives from organic farms in Erin, Transition Erin, the Climate Change Action Group and Credit Valley Conservation. Co-leading the effort is agronomist Ruth Knight. She said the testing would compare the characteristics of actively managed farmland with unmanaged land in marginal, unplowed areas. Instead of focusing on nutrients, teams including citizen volunteers will measure the levels of carbon (organic and inorganic) in soils, and their ability to hold and filter water. The project will build up an “adaptive network” of farmers who can share methods of building soil health and improving water quality. The goal is to produce healthier crops, stabilize farm incomes, and leave good soils to future generations. For more information or to get involved, go to soilhealthcoalition.ca, or email Knight at soilregen@gmail.com. Environmental groups see regenerative agriculture, which builds up soil by allowing it to capture and retain more carbon from the atmosphere, as one of the most important ways of reversing climate change. The coalition says it’s something Erin could be proud to champion. “How does a town define itself?” asked Brent Klassen of Heartwood Farm and Cidery. “We’ve kind of been about horses, and kind of been about something that’s vaguely Irish. It seems to me that we’re on the cusp of being able to really lay claim to something that’s really interesting, really engaging, something that’s really vibrant, that has everything to do with the food we eat, and everything to do with the ways we manage the land that we so fortunately find ourselves on. Quality soil with high organic content not only provides nutrition, but growing plants also make soil one of the most effective carbon sinks – drawing it out of the atmosphere and storing it. Plowing and tilling release carbon from the soil, and conventional methods such as growing a single type of crop and managing it with irrigation, chemical fertilizers and pesticides tends to degrade soil and make crops more vulnerable to disease and drought. “Regenerative agriculture is very good for farmers, as it increases the productivity and sustainability of their soils,” said activist Liz Armstrong. The search for new municipal water just got a lot more expensive, with Erin town council allocating up to $604,000 for at least two more wells. Exploratory drilling and testing at two sites, as part of the Water Servicing Environmental Assessment (EA), has been a disappointment for the town. Sufficient water flow was not found at the existing Hillsburgh fire hall well or the Mountainview site on Kenneth Ave. The search will now be expanded, with four potential sites in Hillsburgh and four in Erin village, most owned by developers. All the sites are in the Credit River watershed, (while the existing Nestlé well is in the Grand River watershed). When the Water EA (separate from the Wastewater EA) was started in 2015, it was based on the projection that the urban population would grow from 4,500 to 6,000. That would have required one new well in Hillsburgh and one or two for Erin village. With a new projection of 14,599 urban residents within about 25 years, Hillsburgh will eventually need two more wells and Erin village up to five more, according to a report by town engineer Christine Furlong of Triton Engineering. “I hate spending money on the flip of a coin,” said Coun. Matt Sammut, while Mayor Allan Alls said, “This is something we have to do.” All members voted in favour. The allocation of funds approved on April 3 will not directly affect water rates, since the money will be taken from the Water Life Cycle Reserve and the Water Development Charges account. The town originally allocated $404,580 to the Water EA, and $215,496 remains unspent. Those funds will be used prior to the $604,000. Furlong estimated that 90 per cent of the well costs could be recovered through targeted development charges, without reducing other development revenue. She said the work would proceed in stages, each to be approved by town staff. Once preliminary drilling confirms adequate water flow, development of the well to production status could be done later. A single well can cost over $300,000 because of requirements for extensive water testing, an archaeological investigation, a cultural heritage evaluation and a natural environment inventory and assessment. One less well would be needed if the two village systems were connected, an option that is under study. Furlong also reminded council that more wells are needed for the existing water system, even if there were to be no growth. Erin currently operates its water system with two wells in Hillsburgh and two in Erin village. The province requires the town to develop an additional well for each community to provide redundancy (back-up) in case of failure or contamination at an existing well. Hydrogeologist Andrew Pentney of Groundwater Science Corp. (who has taken over from Ray Blackport) told council that the amount of money being spent on the water search is typical of that spent by other municipalities. He said it is “not uncommon” to find insufficient water flow at a specific test site, but expressed confidence that the problem is not lack of groundwater in the area. “The water is out there,” he said.